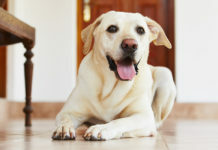 Finding a truly dog proof trash can might be harder – and more important – than you may think! As it turns out, there is some pretty heavy science supporting dogs’ well-documented interest in the contents of the round file. In this article you will learn why dogs love the trash can, why you need a dog proof trash can, the health risks of “dumpster diving” for pet dogs, and some awesome dog proof trash can products you can use! Why do dogs love the trash can? In past decades, researchers were convinced that our ancestors domesticated the friendliest wild wolves to hunt, guard, and live alongside people. But in recent years, that theory has largely been thrown out with the, well, trash. Today, there is a new theory, and it gets right to the heart of why so many pet dogs will take the first opportunity to snarf down the contents of any trash can they see. Researchers now believe that wolves first became socialized to humans by eating our trash! As the theory goes, these early wolves evolved into the dogs we know and love today. So, if your furry sidekick has literally evolved to eat our leftovers, why are veterinarians so busy with canine emergencies the day after Thanksgiving? The truth is, the trash people generate today is likely far more toxic than the trash generated by our ancestors. From moldy meat to discarded sanitary products, sharp-edged plastic, and broken glass to avocado pits and garlic shells, snacking out of the trash can turn a healthy pup into a dog-in-distress in no time. “Garbage gut,” or “garbage toxicosis” as veterinarians call it, describes a condition not unlike food poisoning for people. Animal poison control experts say that one of the more dangerous toxins found on moldy food in the garbage is called Penicillium spp. Symptoms of Penicillium spp. can include vomiting, diarrhea, muscle tremors, high temperature, and seizures. This condition can be fatal if left untreated. Another potent group of toxins often found in garbage cans and backyard compost piles is called clostridial toxins, which includes C. botulinum (botulism). Pups that choose to chow down on garbage or compost may be taking in a whole range of bacteria, fungi, spores, and more! Still another hazard that lies in wait for the dumpster-diving dog is the ingestion of a host of non-food items that may cause dangerous punctures, blockages, and bloat. 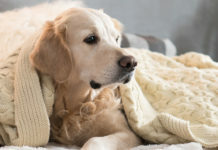 Dogs may also rip into the garbage for other reasons, including frustration, anxiety (particularly separation anxiety), boredom, and actual hunger. This last issue can be particularly problematic during the delicate transition from puppyhood to adulthood, when you are trying to adjust your dog to a new dog food while you are also switching to adult dog portion sizes, and your hungry puppy just wants to EAT. 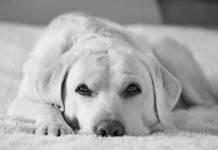 Once you truly understand just how alluring the garbage is to the family canine and why, you can also grasp how determined your dog may be to get to it. This will help you evaluate dog proof trash cans by imagining you are your dog and thinking through how you might get inside even the most dog proof trash can! Sturdy. Sufficiently sturdy material that your dog won’t be able to use sheer force to chew right through it to get to the goods inside. Stay-put lid. The trash can lid won’t topple off or tip open, even if your dog up-ends the trash can itself. Weighty. Heavy and large enough (your own space limitations permitting) that it would be hard for most dogs to topple it over. NOTE: Steer clear of fancy extras like motion sensor-activated top openers. These may be convenient for you, but they will be the equivalent of a wish-fulfilling genie for your trash-loving pup! 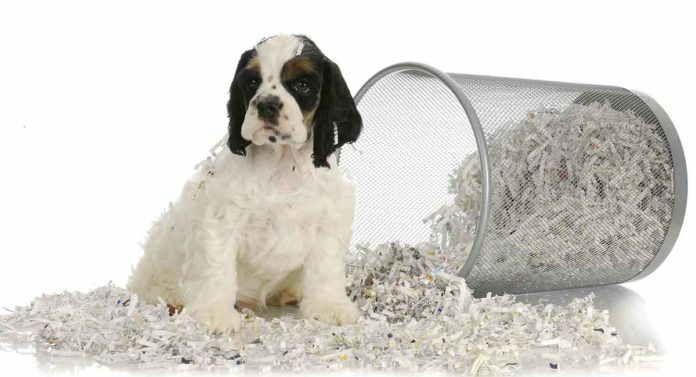 Here is a list of some of the best small dog proof wastebaskets and large dog proof trash can options to consider! Simplehuman 30 Liter/8 Gallon Stainless Steel Round Kitchen Step Trash Can, Brushed Stainless Steel. This sleek and slim round trash can comes in 30 and 35 gallon sizes. It features a strong steel pedal that will be easy for you to operate but puzzling to your pooch. The manufacturer offers a 10-year warranty. Ninestars CB-Sot-30-1 Step-on Round Trash Can Combo Set, 8 Gal. 30 L. And 1 Gal. 5 L, Stainless Steel. This awesome duo features two round trash cans – one small and one large. Both are foot pedal-operated with soft-close lids. Rubbermaid Commercial Defenders Front Step-On Trash Can with Plastic Liner, 24 Gallon, Red. This is admittedly a big-ticket item as far as trash cans are concerned, but this one may be worth it if you have a really determined and strong trash-loving pup in your family! This trash can is OSHA-certified for safety. It has a galvanized steel inner liner suitable to contain hazardous waste. The trash can weighs 34 pounds when empty. It has a sturdy foot pedal for operation. BINO Stainless Steel 1.3 Gallon / 5 Liter Round Step Trash Can, Brushed Steel. This adorable small round stainless steel trash can is perfect for bathrooms, guest areas, and the pantry/laundry room. It comes in six colors with a durable and strong foot pedal. simplehuman 45 Liter/12 Gallon Stainless Steel Rectangular Kitchen Step Trash Can with Liner Pocket, Black Stainless Steel. This sturdy rectangular trash can comes in 30, 45, and 55 gallon sizes. The heavy steel foot pedal operates a silent-close lid (so your pup can’t even hear you deposit new trash)! This trash can comes in 6 colors to match any décor. Fortune Candy Step Trash Can, Stainless Steel Rectangular Trash Can, Garbage Can with Plastic Lid 8-Liter/2.1 Gallon. This slimline rectangular trash can comes in two colors and features an internal hinge so you can push it into the slimmest spaces and your dog can’t bite at the hinge mechanism. Its 2.1-gallon capacity is perfect for smaller spaces. This cute round stainless steel vintage design trash can is foot pedal-operated, comes in two colors, and holds 1.3 gallons of trash. This roomy round stainless steel trash can hold 10 to 14 gallons of trash and has an internal lever system so it can fit flat against any surface. simplehuman 58 Liter / 15.3 Gallon Stainless Steel Dual Compartment Rectangular Kitchen Step Trash Can Recycler with Liner Pocket, Brushed Stainless Steel. This sturdy, durable, and multi-purpose two-compartment trash can comes in 30, 45, 55, and 58-liter sizes. The steel pedal is operated by six AA batteries for silent open/closure. Joseph Joseph 30002 Intelligent Waste Totem Kitchen Trash Can and Recycle Bin Unit with Compost Bin, 16 gallon / 60 liter. If you are looking for a dual purpose trash can and compost bin, this is the trash can for you! The slide-out compost bin will be easy for you to access but confusing for your pup. And the push-open top eliminates even the foot pedal option for your dog. Best of all, the carbon liner keeps escaping smells to a minimum. simplehuman 10 Liter/2.6 Gallon Butterfly Lid Bathroom Step Trash Can. This butterfly lid foot pedal-operated silent-close trash can offers a lovely, elegant way to dispose of your trash that will confound your pup. It also has a hidden internal hinge for extra security and to maximize floor space. It comes in four colors. Brabantia Touch Trash Can. This trash can comes in a wide range of sizes from 0.8 gallons to 16 gallons. It features a touch-open and close system that you will love and your dog will hate. One neat feature is the extra-wide lid for easy trash disposal. Depending on your situation, you may also keep trash outdoors, and this trash will smell just as good to your pup, guaranteed! These outside trash cans are a great option to keep your dog out and your trash safely inside. Behrens 6110 10-Gallon Locking Lid Can. This 10-gallon galvanized steel trash can has a lockable lid. It is fire, rust, and heat resistant and it won’t crack or fade. 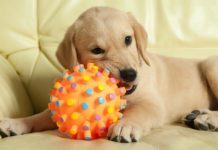 This is also a great option if you have potentially toxic items, like pesticide or fertilizer, you need to keep safely away from your dog. If you need something roomier, try the Behrens 20-gallon trash can instead. Toter 025B96-R1BKS Bear Resistant Residential Heavy Duty 2-Wheeled Trash Can. If this trash can resist hungry bears, it can surely withstand the depredations of the family canine! This trash can features a unique locking lid with steel-bolt hinges to keep the lock in place. The trash can is recyclable and has wheels. A plastic trash can may not be the right choice depending on your dog’s jaw strength, but if your dog can’t chew through sturdy plastic, this trash can offers a durable, economical option with a button-lock spring-release top. Carlisle 34101003 Bronco Round Waste Container (Lids sold separately). These super-sturdy, heavy-duty, and strong plastic trash cans are food-safe and come with equally sturdy lids. Sizes range from 10-gallon to 55-gallon in several colors. You may have just invested in a new trash can you love that is a perfect fit in its little corner and matches your décor. 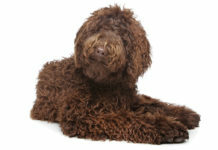 There is just one teensy issue – you caught your pooch rooting through it yesterday! If this describes your situation, you may want to consider these dog proof accessories to keep the lid firmly on the top of your new trash can. Munchkin Xtraguard Dual Action Multi Use Latches. This set of latches uses a dual push-button action to release each latch, which is something no canine will be able to master. These are bendable so they can easily be used to secure the trash can lid on two sides. Edelein Child Safety Locks (White) | Best Dog Proof Trash Can and Garbage Latch. This simple gadget uses a triple-release action on two latches to puppy-proof any trash can. You get two bendable latches that are fully adjustable – you can trim the 12-inch strap to any length you require. Trash Buddy – Dog Proof Trash Can Lid. If the outside trash can is your biggest concern, this uniquely handy latch will keep your dog out without making your trash pickup service take an extra step to dump your trash. The cord has three tension settings. Each will permit the bin top to fall open only when the garbage can is turned upside down by a person or a dumpster arm. 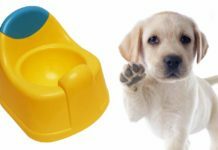 We hope this curated article featuring some of the best dog proof trash can options will help you keep your pup healthy and happy for many years to come!